If you are an online retailer then you would have surely done some analysis for coming up with various techniques for increasing your sales. The results of your analysis would undoubtedly consist of one major feature related to shipping. FREE SHIPPING is certainly the most popular feature that attracts multiple users for buying from online stores. A free shipment is the master key to success in the ecommerce industry. In the initial days of ecommerce, customers had to pay for shipping as they had no alternate options at all. With the introduction of the free shipping process, the ecommerce stores were flooded with customers and resulted in a high rise in sales and profit for the retailers. Free shipping is like a dream come true for the customers which tempt them to indulge in impulse purchases. Statistics suggest that more than 50% of customers are likely to abandon the online shopping carts if the free shipping option is not available. Hence, free shipping is no more a choice but a necessity for you to grow in your ecommerce business. If you have not yet implemented free shipping for your online products then you are likely to get lesser number of customers at your store. Why should you incorporate free shipping into your business? Let’s learn some amazing tips and tricks that will give you maximum ROI with Free shipping. Providing free shipping on every single product is hardly possible for a beginner. If not handled properly, shipping costs can become a huge burden. Hence various tricks should be implemented for making the idea work effectively. You must be aware of ‘Amazon Prime membership’- the trump card played by Amazon which raised the graph of their loyal customers rapidly. Amazon has thus set a benchmark for all the other ecommerce marketplaces who wish to make a profit using the ‘Free Shipping’ trend. Free shipping may look appealing but it is worth trying only if you can make a profit out of it. Many online retailers have tried free shipping as an experiment and suffered as they could not plan it correctly. Irrespective of the size of your business, if you are also trying to please your customers with ‘Free Shipping’ then here are a few tips which may help you. The foremost step for turning your dream of free shipping into reality is by analyzing your conversion rates. Comparison of conversion rates with and without shipping costs coming from ecommerce shipping and courier partners is a must. Once you have a final report, you can have a clearer picture whether you can carry out free shipping or not. Once the free shipping is offered, a number of users are likely to visit the online store and buy their favorite products. An increase in the average order value of a company can be considered as a green signal for continuing the process and earning profits and customers. ‘Free shipping’ - spells magic for the customers all over the globe. Considering this fact, a smart way to make a better sale is by setting a threshold of a minimum order value for the customers. With this trick, one can sell more products and improve the margin of profit coming from free shipping without affecting the share involved for ecommerce shipping partners. One more way to do so is by introducing various offers and deals during a specific time of the year. People hunt for new products during festive seasons and love to buy pocket-friendly products during the offseason. Creating a buzz on the social media, PUSH notifications and email marketing during such time helps a lot. The overall free shipping conversion rates are likely to increase along with the number of visitors turned into loyal customers. You can also increase the product prices to compensate for the loss you take because of free shipping if there is any. Free shipping on selective products which are profitable for you and a prime attraction for your customers can raise your profit bar a bit more. If you wish to grow more, you have to do something exceptional. Though Amazon has already set the trend you can also give it a try. Ask your customers to join the loyalty program by paying a specific amount of money and offer them free and speedy shipping for a certain period of time. Once the customers have signed up for your loyalty program, the number of orders per customer will increase gradually and make you aware of the impact of free shipping on sales. You may be hesitant about offering free shipping on all your products initially. Trying this experiment on selected products is an also a good option at the beginning. The customers who purchase and retailers who sell can gain equally with free shipping. If you are still thinking, it’s time to give it a try. ShipKaro is aimed at doing exactly the same for businesses of all size by offering a host of features and most importantly discounted shipping. We take away the pain of ecommerce logistics by offering discounted shipping rates to the customers. ShipKaro platform has multiple trusted shipping partners that can be used to offer FREE Shipping to your customers. 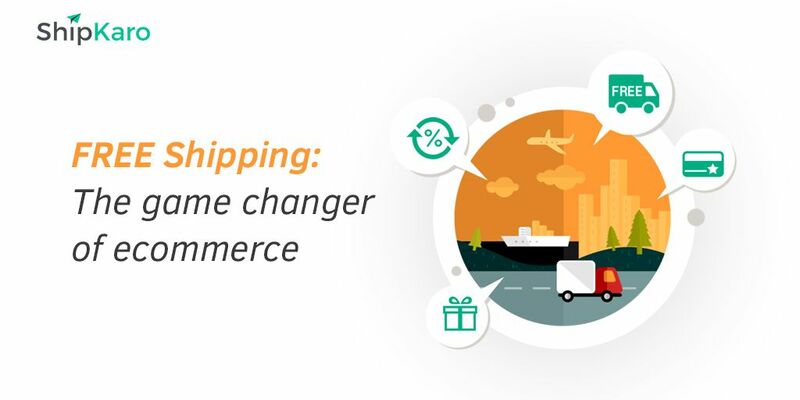 To make the idea of free shipping a reality, you need a combination of factors like good ecommerce shipping partners, discounted pricing and multiple logistics providers that help you optimize your shipping costs. Start Shipping with ShipKaro to maximise your ROI with free shipments that bring back customers to your online store.